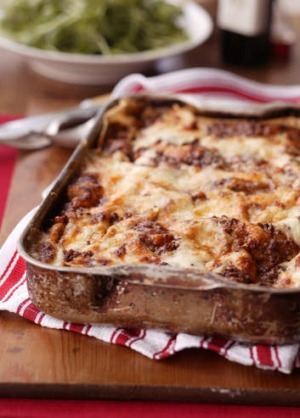 Real lasagne is such a treat - a celebratory dish to be shared by many. Try my traditional bolognese version. It might look like an epic recipe but it's not that daunting. The bolognese and bechamel can be made a couple of days in advance and even frozen, and the entire lasagne can be assembled the day before and then baked on the day, making it perfect for a dinner gathering. See Brigitte Hafner's egg pasta recipe for lasagne here if you would like to make fresh pasta. 1. Heat a heavy-based pot and, when hot, add the oil and butter, then the onion. Saute for a few minutes until soft then add the carrot and celery, then the garlic. Cook gently until they have softened and are lightly golden. 2. Add the mince, crumbling it in the pot with a fork. Season with salt and pepper, and cook briefly until the meat is no longer red, but do not brown it. It's important to salt the meat at this stage to extract its juices for the sauce and to cook the meat gently so it retains delicacy. 3. Now add the wine and bring to the boil. Cook for a few minutes on high heat before adding the rosemary and tomatoes. When it starts to bubble, turn the heat to the barest of simmers, partly cover and cook for 1 1/2 hours. Stir the pot from time to time, adding some water if necessary. This is not a gluggy, tasteless white glue. When made well it is a delicious and velvety smooth milky sauce delicately flavoured with bay, peppercorns and nutmeg. 1. In a pot, melt the butter then add the flour and stir with a wooden spoon. Cook on medium heat for a few minutes but do not let the flour colour. Take a whisk and pour in the cold milk all at once, whisking constantly. 2. Continue to whisk as the sauce heats and comes to the boil. Initially you will have lumps, but as the mixture comes to the boil, the sauce will thicken and become smooth. Add a good pinch of salt, the bay leaf, peppercorns and grated nutmeg if desired. 3. Turn the heat to a low simmer and cook for 15 minutes, stirring often. The sauce should have a thickish pouring consistency. The longer you cook the sauce the thicker it becomes. Remove from the heat and cover with plastic wrap to avoid a skin forming. This sauce can also be made ahead and lasts for a few days. Reheat over a low heat and stir constantly. I find it easiest if the bolognese and bechamel sauces are not cold, so if you need to reheat them, do so gently. Bring a large pot of generously salted water to the boil while you roll out the pasta dough. 1. Cut the dough in half and roll it out to the thinnest setting. Cut the sheets in 25cm lengths and lay out on a lightly dusted workbench while you roll out the rest. Bring a large pot of salted water to the boil and place a large bowl of cold water near the stove. When the water is boiling rapidly, drop in a few sheets at a time. Cook until the pasta is al dente, scoop out with a slotted spoon and put into the cold water. Continue until all the pasta has been cooked. Drain the cooked pasta sheets and lay them out on tea towels or a tablecloth and pat dry. 3. Use a large baking dish with high sides (I use a 25cm x 35cm dish). Smear it generously with butter and spread a thin coating of bechamel and bolognese sauce on the bottom. Sprinkle on a little grated parmesan and cover with a layer of pasta sheets, cutting them to fit the dish. 4. Top with another thin layer of bechamel and bolognese and a sprinkle of parmesan. The key here is not to be heavy-handed with the sauces and cheese, or else the lasagne will become overly rich and clumsy. Continue until you have about six layers of pasta or you have almost run out of ingredients. 5. For the topping you can go two ways; either use just the bechamel and a generous sprinkling of parmesan and a few dots of butter or a last thin layer of bolognese, parmesan and butter. I use whatever I have left over, but that depends on how much bolognese has been mopped up with bread for a snack before the lasagne gets finished. 6. Bake for about 20 minutes or until the lasagne has a light brown crust. * Remove from the oven and allow to rest for 10 minutes before serving directly from the dish. *Note: I find the lasagne turns out best when it stands for 30 minutes before baking. You can even prepare it the day before and then bake it, but you will need to cook it longer and at a slightly lower temperature.